We pride ourselves on our ability to work with families to demystify the standardized testing process. Keeping with our philosophy of addressing the individual learner, we develop a personalized test prep plan for each student based on our extensive experience and proven methods. Unlike many other tutoring services who simply direct their students to the SAT, we carefully evaluate each student to determine whether the SAT or ACT will best represent his or her strengths, and whether SAT subject tests are advised. After assessing the student’s academic background and previous testing history, we provide each student with a personalized study plan designed to maximize scores. After twenty years of preparing students for these tests, we have the results to prove our methods effective. Our typical SAT student sees an overall score improvement of 300 points, approximately 100 points per section. 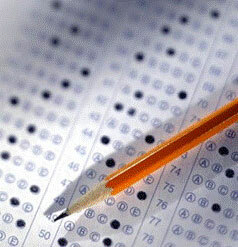 ACT students generally experience a composite increase of 6 points. Our test prep tutors have extensive experience with all aspects of standardized test preparation. Tutors are available to cover all parts of the tests, including Math and Science, English, Critical Reading and Writing as well as specific subject areas. Strategies - Master techniques for answering multiple choice questions, including estimating skills and guessing strategies to tackle confusing questions. Shortcuts - Identify questions that can be answered without actually solving the problem. Save valuable time to be used elsewhere on the test. Effectively and efficiently use calculators to save time. Learn when to skim and/or skip reading passages. Specifics (Subject Knowledge) - Students review relevant math, grammar, vocabulary and reading concepts, as needed based on their individual strengths and weaknesses. Secrets - Learn the test inside and out. Discover and identify each question category, where the test writers expect errors and how to avoid them. Mastery builds confidence and confidence raises scores. This week long course will provide an overview of standardized test options, including the ACT, the SAT I and the Subject tests. It will address specific test content, format and strategies to assist each individual student in determining the best standardized test plan for him or her. By identifying each student's unique strengths and weaknesses, this workshop will provide participants with a starting point from which to launch their preparation. Which test will best represent my strengths, the ACT or the SAT? When should I start preparing for the test? How long will I need to prepare? Should I take SAT Subject tests?